Ekiti State Governor Kayode Fayemi has expressed concern over the stateâ€™s debt profile under the immediate past Ayodele Fayose administration. The governor said his predecessor left an humongous debt profile of N155,791,785,214 as at October 16, before he assumed office. 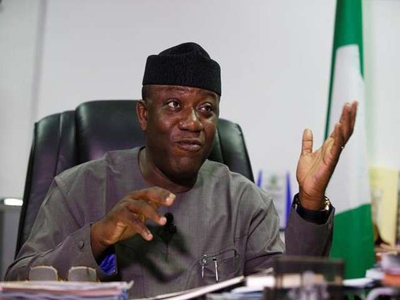 Fayemi made the allegations in his â€œState of the Stateâ€ address marking his administrationâ€™s first 100 days in office on the floor of the House of Assembly in Ado-Ekiti, the state capital. He said the debt profile figures, which encompass the accounts of the state from October 2014 to last October, were arrived at after engaging the services of an external auditing firm, the Price WaterHouse Cooper, to thoroughly audit the stateâ€™s books. The breakdown of the debt profile, the governor said, included loan, N57,694 billion; salary arrears, N16,777 billion; outstanding leave bonus, N4,402 billion; outstanding (National Youth Service Corps) Corpersâ€™ allowance, N28,883 million; outstanding subvention, N4,770 billion; pension and gratuity arrears, N39,775 billion and outstanding contractors claims, N28,575 billion. Others include outstanding furniture allowance, N470,266 million; outstanding severance allowance, N586,144 million; monetised vehicle arrears, N101,243 million; outstanding warrants, N386,777 billion; outstanding (Federal Inland Revenue Service) FIRS obligation, N184,215 million; traditional rulersâ€™ arrears, N150,214 million; judgment debts, N95,048 million and other outstanding liabilities, N1,792 billion. Fayemi noted that though his administration had tried to distance itself from political witch- hunt and media trials, but â€œthe fact that the present is the product of the past is incontrovertibleâ€. Fayemi said his administration inherited a state that was in chaos and a people severely disoriented under a suppressive government that allegedly raised and promoted deceit into a stagecraft. â€œThe last 100 days have clearly shown to us, in a very practical manner, that with clarity of vision, the resolve to push through and the unflinching support of the people, there are endless possibilities in our capacities to steer our state on the path of progress. â€œDespite the meagre resources at our disposal, we are meticulously delivering on our promises to the people through our various short, medium and long-term socio-economic intervention programmes. â€œWe must examine our tortuous path with a view to charting a new course for a prosperous destination, not only for us but also for our unborn children,â€ he said.